Pune: Titan Company Limited in collaboration with the Tata Group is proud to associate with Rana Uppalapati, Titan’s business associate and international skater who kick started his journey on skates to cover the Indian Golden Quadrilateral (all of 6000kms) in the next 90 days. The flag off was at Hosur, Titan’s 1st watch factory on 5th September and covered Tumakuru,Sira, Chitradurga., Hubli and Belgaum in Karnataka and reached Pune after skating through Kolhapur. As part of the 90 days journey, the program will raise funds for the education of 25,000 underprivileged girl children and create awareness among 6 lakh children on child safety, especially on ‘good touch and bad touch’. Sharing his viewpoint on the occasion, Rana Uppalapati, Titan’s Business Associate, said that “It’s a great initiative to be a part of along with Titan Company Limited. Titan and I are both passionate about the education of girl child. We also want to do our bit on child safety to educate children, not only girls but also boys on Good touch and Bad touch’. 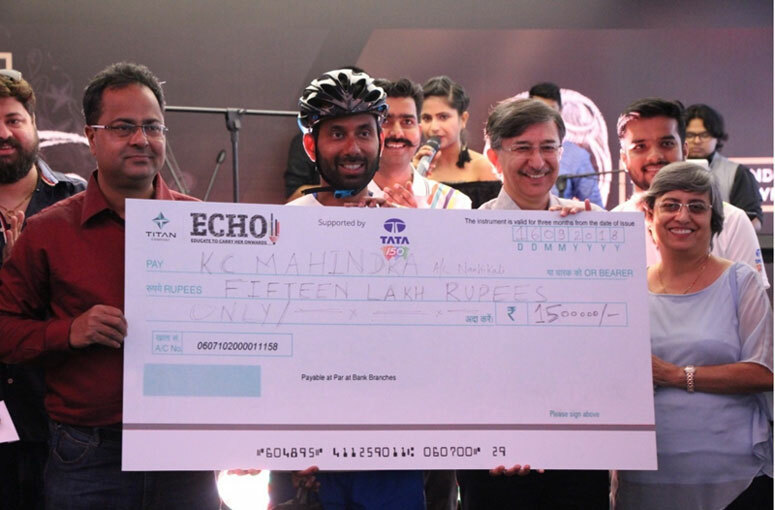 Additionally, this campaign will also witness organisations like K.C Mahindra Educational Trust Mumbai and IIMPact, Delhi coming together as partners towards whom the funds collected will be disbursed. Both organizations have already partnered with Titan in their ongoing program of remedial education of the girl child. Titan is also associating with CII-Young Indians and their Project Masoom for training on child safety. CII-YI and Titan will carry out 6000 awareness sessions for children on ‘Good Touch and Bad Touch’ as part of ECHO programme. The logistics for Rana’s journey will be taken care of by “You too can run”. Titan Company Limited (earlier known as Titan Industries Limited), a joint venture between the Tamil Nadu Industrial Development Corporation (TIDCO) and Tata Group, commenced operations in 1987, under the name Titan Watches Limited. In 1994, Titan diversified into Jewellery and subsequently into eyewear with Titan Eyeplus. In 2013, Titan entered the fragrances segment with SKINN. Today, Titan Company Limited, India’s unchallenged leader in watches, jewellery and eyewear, is credited with changing the face of all these industries. The financial year 2017-18 recorded a topline growth of 20.4% on a standalone basis. Titan Company Ltd reported a revenue of Rs.15, 656 crores for the year ended 31st March 2018.